"A very easy and great tasting soup." Preheat oven to 400 degrees F (205 degrees C). Cut pumpkins in half and scoop out seeds. Spray a cookie sheet with non-stick cooking spray. Place pumpkins, flesh side down on the cookie sheet and roast until soft to the touch, about 45 minutes. Remove pumpkins from oven and let cool. Once pumpkins are cool scrape flesh from skins into a food processor. Discard skins. Warm, Autumn comfort in every spoonful! I used canned pumpkins instead. It was much easier and still very tasty! 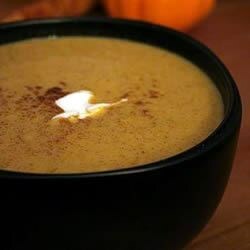 This soup will accompany our Thanksgiving dinner this year. Thanks for the delicious and easy recipe! Very good soup. I used canned pumpkin to save time AND I also thought it needed a little extra flavor so I added some orange juice. Turned out fantastic! My dad couldn't get enough.